River Valley shortstop Chase Barber attempts a tag on a sliding Alexander runner during Friday night’s 15-9 loss to the Spartans in Bidwell, Ohio. BIDWELL, Ohio — The runs came for the Raiders, but not soon enough. 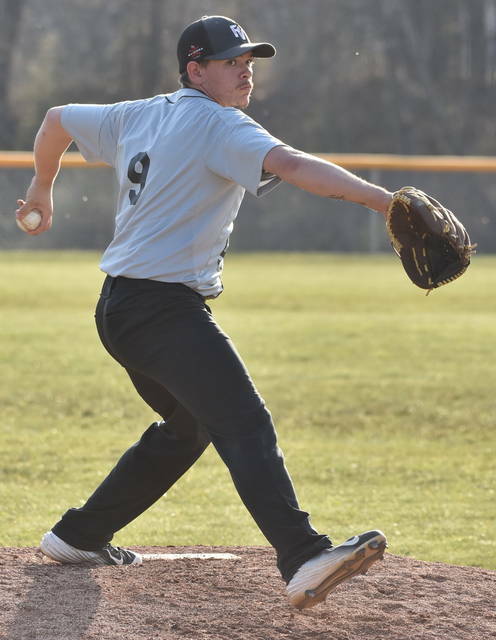 The River Valley baseball team trailed by four runs through three innings of Friday night’s Tri-Valley Conference Ohio Division, but the visiting Spartans tacked on eight additional runs to earn a 15-9 win in Gallia County. The Raiders (0-5, 0-4 TVC Ohio) trailed 1-0 in the top of the second, as Alexander (7-2, 5-0) manufactured a run by way of three hits and an error. The Spartans tacked on six additional runs in the third, as they sent 11 hitters to the plate and utilized six hits and two Raiders errors to increase the deficit to 7-0. River Valley countered with three runs in the bottom half of the third inning, as Wyatt Halfhill, Jack Farley and Chase Barber scored runs to cut the lead to 7-3. Alexander furthered its advantage in the fourth, as four hits and an error propelled the visitors to a 11-4 lead. The Raiders narrowed the margin to 11-6 in the bottom half of the frame, when Halfhill led off with a hit by pitch and was followed by a walk to Andrew Mershon. Both runners scored on an error off the bat of K.C. Mershon, who later scored on a fielder’s choice. Both teams added a run in the fifth, as Alexander maintained a five-run advantage of 12-7 entering the sixth frame. Alexander tacked on three runs in the sixth, while Barber scored for River Valley in their half of the frame to bring the score to 15-8 entering the finale. River Valley plated one run in the seventh, as the Spartans closed out the six-run victory. Will Edgar, Derek Johnson, Halfhill, Collins, Farley and Barber each finished with one hit apiece for the Silver and Black. Truax earned the pitching victory for the Spartans, as he went 4⅔ innings and surrendered five runs, with four hits, four walks and two strikeouts. The Raiders returned to the diamond on Saturday to face county rival Gallia Academy in Centenary, Ohio.